Stop fiddling with your goddamn radio, d’ya hear? Turn it off! It’s late night at the campus, thin walls don’t isolate the sounds coming from a room. It’s not a radio, it’s a disciple of professors Theo P. and Kenny D. who has well progressed in Deep House Research. The outcome is in front of us: Filling the A-side, “A Tender Places” is a juicy and stripped-down deep house track that tells how to engage in different carnal activities, all night long. At 2:22 we encounter a sudden break and some empty grooves but the same track goes on with accelerating rhythm towards the end. On the flip, deep grooves persist in more ordinary “Nose Candy” before all changes in “Heroin”. The B2 track is just audio arts with kaleidoscopic noises and samples chasing each other. “Heroin” is like a movie by Iñárritu and in stark contrast to suave deep house cuts. Timo Rohula works under the cryptic moniker of Bakey USTL. He comes from a place called Vändra in central Estonia and currently studies audiovisual arts at Gerrit Rietveld Academie in Amsterdam. “E.P. 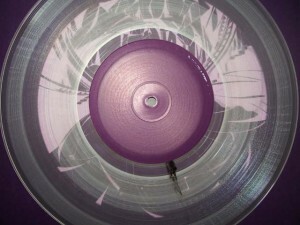 1” is Bakey’s debut single, after tracks in two Various Artists releases of Estonian label Umblu (recently “Kila Kola”). Impressive start with Moodymann-style deep house, not to to speak about the experimental B2 track.